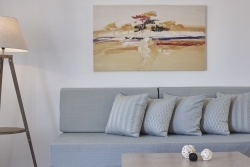 Discover the elegance of our 12 suites in Santorini and let yourself enjoy the tranquility. 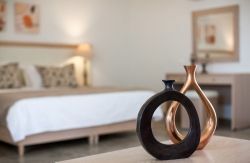 Comfortable and welcoming superior rooms that can accommodate 2 people in their spacious premises. Enjoy the sea view or the city view and the daily sun’s journey on the sky. Interiors with modern decorations open out into private expansive balconies which, feature views of the East side of the island towards the sunrise or have city views. Individually controlled air conditioning, Shower, Coffee machine, Flat-screen TV, Free WiFi, Hairdryer, Minibar, Safety Deposit Box, Soundproofing, Telephone, Wake up service, towels , robs, slippers and bath amenities, sunbeds. Children under 5 stay free in a room with two adults. Supplement for extra bed € 50 per night, available for a number of rooms. high quality services and great facilities. 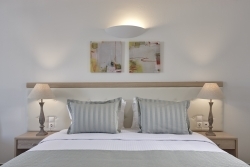 The ideal choice for your stay in Santorini.